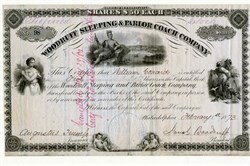 Beautiful stock certificate from the Woodruff Sleeping and Parlor Coach Company issued in 1873. This historic document was printed by the Lith by American Bank Note Co., and has an ornate border around it with a vignettes of a Native American overlooking a river and city scene, classical female to the left, farmer to the right, and cherubs at the bottom. This item is hand signed by the Company�s President, Jonah Woodruff and Secretary, Augustus Trump and is over 134 years old. Incorporated in 1871 in Pennsylvania, the company designed and built sleeping cars and passenger coach cars for the railroads. Jonah Woodruff, upset with Pullman's monopoly and ownership of his earlier patents, designed radical new cars with luxury and weight savings. When Woodruff's health declined, the company was taken over by Pittsburgh businessmen who continued to win many railroad contracts for their cars. However, finances wore thin and the company merged with the Mann Boudoir Car Company. Union Palace Car Co. was organized firm that was a consolidation of the Woodruff Sleeping & Parlor Coach Co. and Mann Boudoir Car Co. Organized in December of 1888. Later, the Union Palace Car was bought by Pullman , making the venture a circular end. Pullman used Woodruff's patents to develop his own line of passenger and sleeping cars and ended up merging their assets. After the Pike Peak's gold rush was over, he was facing some stiff competition from both Webster Wagner (New York Central Sleeping Car Co. - later Wagner Palace Car Co.), Theodore T. Woodruff (T.T. Woodruff & Co.; Central Transportation Co.) and his younger brother Jonah Woodruff (Central Transportation Co.; Woodruff Sleeping & Parlor Coach Co.). To make a mark of his own Pullman theorized he would have to pull out all the stops and come up with a sleeping car so luxurious that wealthy patrons would get in line to board it. After a chance meeting with future steel magnate Andrew Carnegie � who held a substantial stake in the Woodruff brother's Central Transportation Co., Pullman's largest competitor � at Manhattan's St. Nicholas Hotel, the two businessmen formed the Pullman Pacific Car Co., a $500,000 firm organized in November of 1867 to provide the Union Pacific railroad with sleeping cars. In 1889 Pullman purchased the Union Palace Car Co., a recently organized firm that was a consolidation of the Woodruff Sleeping & Parlor Coach Co. and Mann Boudoir Car Co. Although operated from the Pullman offices in Chicago, Woodruff retained its corporate identity until 1909.